First step is to get some new fabric applied to the inside of the hull. This closes up the hole and makes it look seamless on the inside. This is a Kevlar/carbon fiber blend. 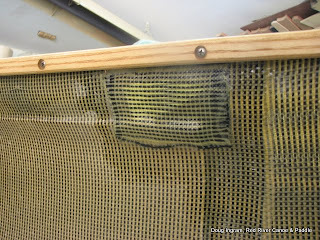 Kevlar does not sand well, it just goes fuzzy, and is a real pain to work with for repairs. 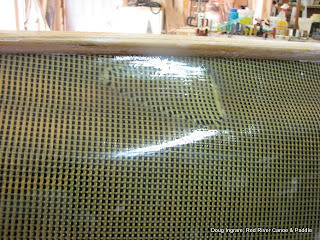 Its not too difficult to get the structural work done on laminate canoes. The real "work" comes with the cosmetic aspects of blending and polishing. 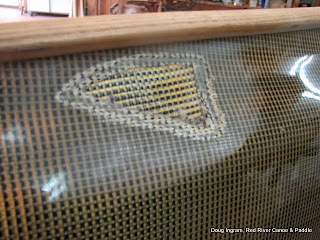 With a pattern weave like this Kevlar/carbon fiber blend, it is difficult to get the weave to blend in invisibly. Posted by Doug Ingram at 10:20 a.m.